A bike for seven people? Impossible? When people first see it, they continue to wonder: The riders do not sit one behind the other like with a tandem bike, but in a circle! The TeamBike cannot be compared to anything you've ever experienced. It is something completely new and innovative. It is not like any bike you've ever ridden. It's safe and fun for all ages and riding abilities. We offer two different tours through Prague's Old Town as well as rental options. Everyone can enjoy the ride even if you've never ridden a bike. Experience 360 degrees of panoramic exhilaration. Join us, or make your own PARTY ON WHEELS! Bike delivery prices for Old Town area of Prague is free. 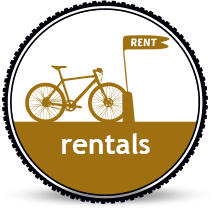 We can arrange to deliver TEAM-BIKE to the place of your choice. Please ask for the quote. The Team-bike is a bicycle for seven people which are sitting in a circle and are looking inwards, towards each other. It is tricycle-shaped but has four car wheels, two of them as double tires at the rear. Steering employs a rack steering gear from a car. The saddles can be adjusted in height in a wide range, thus enabling people with a size from 1.40 to 2.00 meters to ride the 7 seat Bike. As a completely Human Powered Vehicle it has the legal status of a bicycle. It is allowed on the streets and is not bound to bicycle lanes because of its width. By the unique arrangement of the seats all riders start conversation very easily. The Team-Bike is a "social tool", a "communication catalyzer" which brings people together and creates team spirit. It can be used for team-building, seminars, and guided tours with small groups around Old Town area, on the river sides and in the parks. In the area of bicycling with blind or otherwise handicapped persons it can provide exceptional experiences and sometimes even amendment. A growing focus is the use as a marketing or advertising tool (our Team-Bike was used at summer music festivals, different kind of events, or by T-Mobile & Nokia companies). By applying several kinds of advertising space the Team-Bike can work very well as promotional tool.